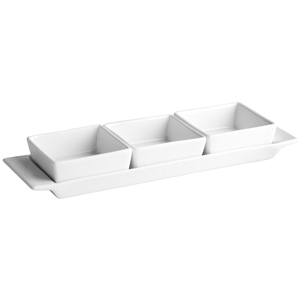 The Moonlight Rectangular Tray with 3 Serving Dishes is the versatile way to serve a variety of condiments, sauces or dips. With a porcelain serving tray, this condiment set provides the ultimate in elegant table sauce service. Also ideal for serving nibbles, appetisers or tapas, these dipping dishes have a practical versatility.